It all started with a innovatively designed chair. Not your regular plastic, factory made portable. This one could be folded up, picked up and carried anywhere. And it was made of a material we usually packed stuff in: cardboard. The folks from Multihabitar, Spain left us with this gem of knowledge when they visited India in February 2014. It seemed a shame to let this useful repurposing of material concept go to waste. Jose Milara saying, “architecture and design should evolve to be more social and closer to people” made absolute sense as Multihabitar graciously agreed to shared the design and the data. Open source, that’s the future. 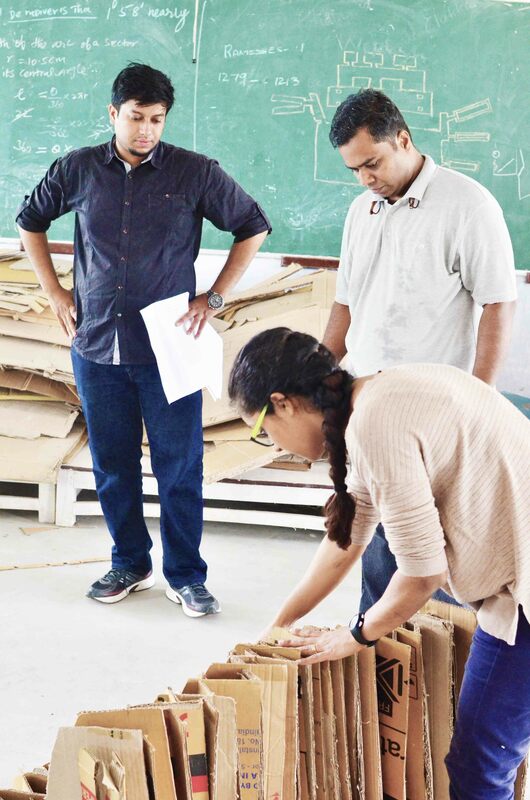 Here’s where it begins: a design thinking and cardboard furniture at PRIME College of Architecture & Planning, Nagapattinam, TN. 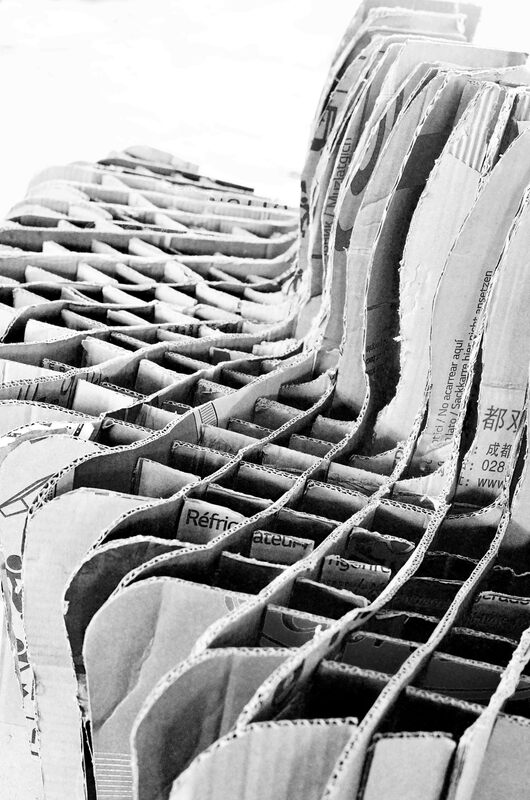 This would be the cardboard sofa’s first journey since it reached India. We got cracking. Hired a car and hit the Tamil Nadu tarmac, smooth running all the 506 km we covered. Far from the bustle of Bangalore, our destination was on the scenic but yet to develop eastern coast of India. Day 1 was a talk and introductions so we could hit the ground running on day two. 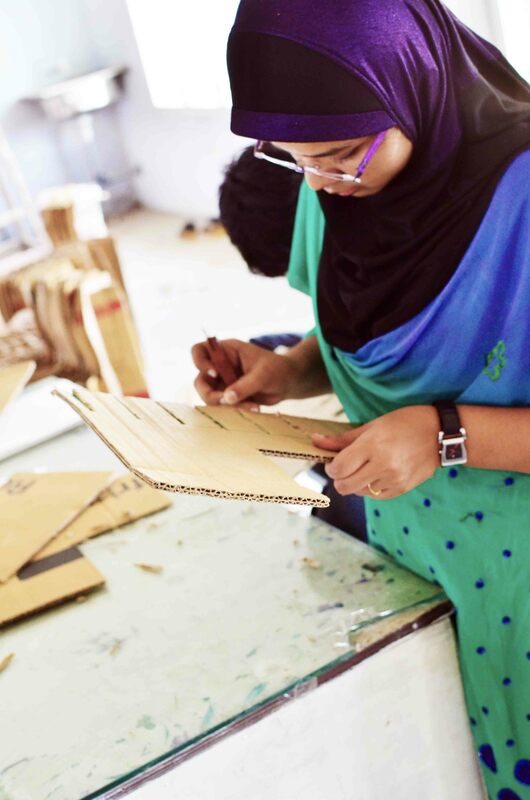 Our workshop was structured to be completely hands-on where the learning module based on engagement, experience and experimentation –– we started with 30 students demonstrating how waste cardboard boxes don’t have to be disposed but instead can serve as useful material to create an array of items and furniture. The enthusiasm was infectious right from the start. Students wasted no time in procuring the exact dimensions of cardboard needed. In a matter of a few hours the students, working in groups managed to prepare the pieces that would come together to form the sofa. 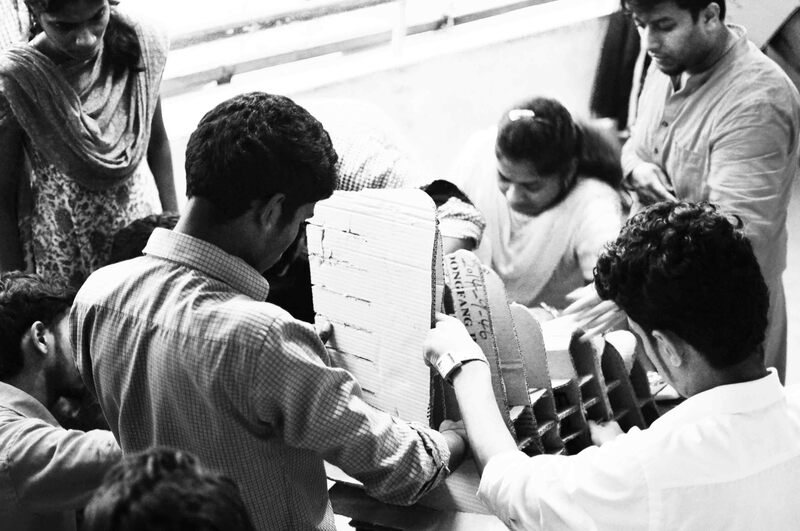 It was nearing college closing time but the students determined to finish the sofa, refused to leave. We began assembling the sofa around sunset. With a lot of hands and a few people yelling ‘no that’s not how you do it!”, we had finally assembled the sofa in two hours flat. The cardboard sofa could be extended upto 2.6 M when fully stretched. The students were overjoyed: a bout of selfies followed by the students stretching out on the sofa, slightly apprehensive of it giving way under their weight. As predicted the cardboard stood true to its structural strength when combined. In the meanwhile, the creative thinking workshops had students debating ideas, questioning smart cities, converging on idea, diverging on perspectives. Good stuff. The next day students returned with a renewed sense of eagerness, ready to build their very own sofa or cupboard or shelf. They applied the methodology from the sofa to create their own design and then build it. A few hours of brainstorming, cutting and we had a single chair, a scaled down shelf, a stationery holder, an abstract garden seater and a ‘couple’ chair. Their input to design and grasp of new ideas was impressive. 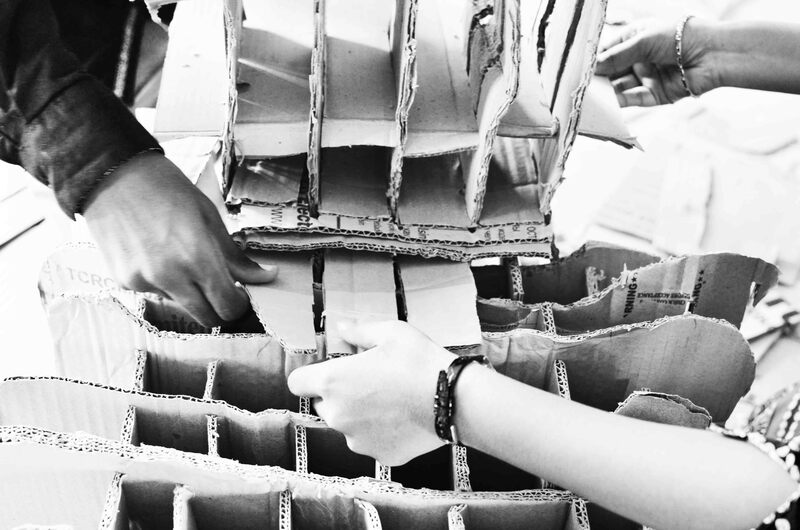 In a matter of a few hours they were able to apply their learning to create innovative and new items using cardboard. And that’s what defines design, the localised context of a globally evolving movement. A big Thank You to all the faculty and students from Prime and all the wonderful architects from Multihabitar. Happy times. Text by Reuben Jacob, Bangalore 2015. THE Workshop: Anabelle Viegas, Craig D’mello, Reuben Jacob.